Well, it has been a few weeks since I have managed to write a post. One of my last posts was about getting back into shape. I set a goal of working out (jogging) for 20 minutes 3x a week. That amounts to 1 hour of exercise each week! Woohoo. 1 hour a week of something that is good for my physical health. And the end result is – I have been successful! I have managed to carve out 20-30 minutes 3x a week since I made that post. Yay! But then there is balance. I added physical activity to what was already a precarious pile of things to balance in life. And very soon after this blog became conspicuously quiet. Two more posts, then nothing! For 6 weeks. Yikes. It turns out, with how life is right now, I have exactly 1 hour of time in the week to contribute to my own health. I can choose jogging (something good for my physical health) or I can choose to blog (which I find quite refreshing for my mental health). I have 1 hour. 60 minutes. That is it right now. Hmmm. So what to do??? Hey, you can find more than 1 hour! You just have to look harder or practice better time management. Nut up and find 2 hours a week for your own health. Physical activity is also good for your mental health. So just do that and stop blogging. Jog and blog at the same time – join a gym – set yourself up on a treadmill and draw and type while running. Multitask! Hmmph. None of those answers really work for me (sometimes your best friend doesn’t actually have the best advice). Right now I am lucky and one of the major things I have been balancing (graduate school) is on break for a few weeks. Phew. So for now I will breathe a sigh of relief, jog and blog, and hopefully in the next few weeks figure out how to better balance all of the demands of life with the little extras that make me feel healthier. Do you face these same challenges? How do you figure out what to do and what to let go? 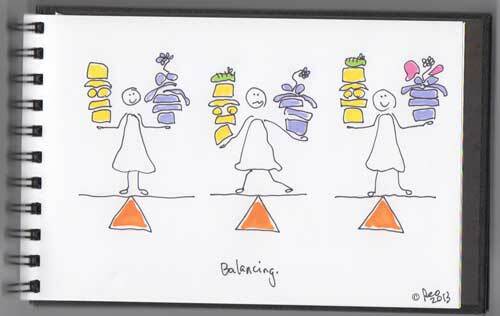 How do you balance caring for others while caring for yourself? And finally, how do you take care of your physical and mental health? Is one more important than the other? If you had to pick only one to focus on which would it be? I hope this post finds you well (both physically and mentally)!